BBFC certificate at the start of the film! 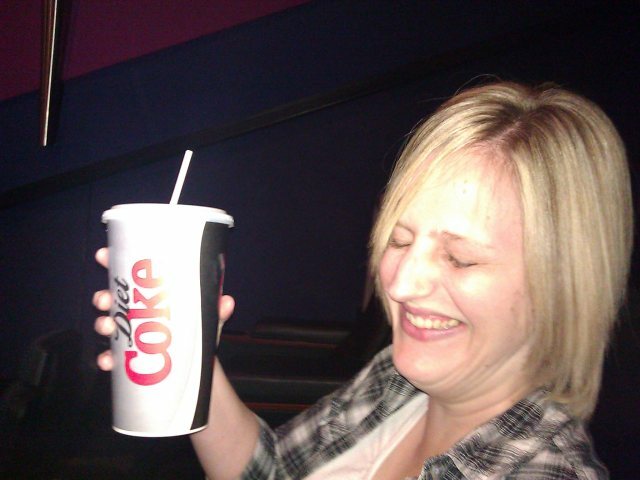 That's Carrie holding up her drink of Fanta that (as you can see) is about the size of her HEAD. LOL. The film itself was busier than we expected though, with each new film in the series we've noticed less and less people, but this time there were a whopping *10* people in the cinema (including us) :) I've read the books and found it pretty faithful (for the most part) although the ending scene was slightly different to the book (same "meaning", it just wasn't the same way). Of course there was lots of sideplots missing, but considering it's already 2 and a half hours long... Like the previous films, it didn't feel like it and I was captivated for the entire duration. I'll certainly be buying it on Blu-ray as soon as they release a boxset! Apparently the US remake is in filming for a release next year so I don't know what I think about that (Daniel Craig as Blomkvist?!) and I certainly can't see it being as "gritty" as the films/books... but I'll watch it anyway. They have a lot to live up to though!